Located on the northeast section of the Third Ring Road, Sanyuanqiao overpass will be replaced tonight, Friday November 13th 2015, within 24 hours. This overpass is one of the busiest traffic hubs in Beijing, linked the city with Beijing Capital International Airport: 200,000 automobiles daily, 48 buses routes carrying 726,000 passengers. “If the job is completed as planned, it will set a record in China for the shortest replacement time involving such a large structure in heavy-traffic downtown areas”, the Beijing Municipal Commission of Transport said on Tuesday. In the past, building an overpass in downtown areas would have taken at least 2 months to complete. Completed in 1984, the original pass will be replaced with a new one weighing 1300 MT using special dollies – low, wheeled platforms. 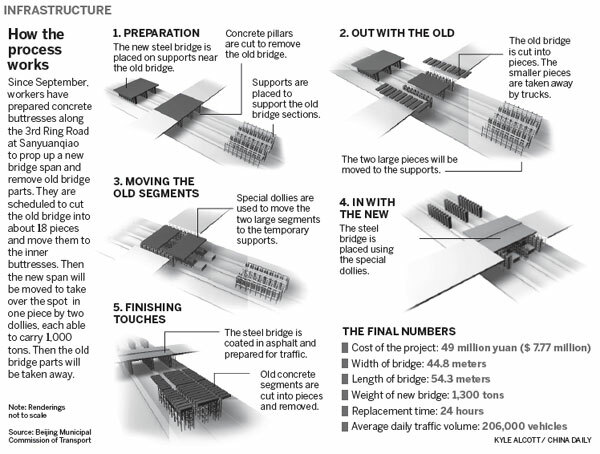 In this graphic from China Daily, the whole process is explained, step by step. Preparation work started since September, preparing concrete buttresses along the 3rd ring road. the new bridge has been placed on supports near the old bridge; concrete pillars supporting the old bridge have been cut and supports have been placed to receive the old bridge. two large pieces will be moved to the supports using special dollies. the new bridge (54 meters long, 45 meters wide and weighs 1,300 tons) will be placed using special dollies – it should take 4 hours. 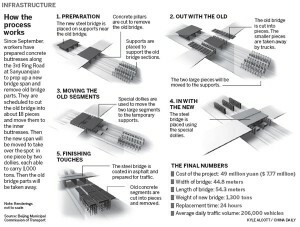 the new bridge will be prepared for traffic (asphalt) and connected to the road in 13 hours ; the old bridge will be cut into pieces for being moved out.